Today I got to be one of the Coral Gables Country Club Wedding Photographers, and in doing so I crafted this romantic, yet very unique shot of my clients..
Now, back inside at the Coral Gables Country Club after the ceremony had finished, I wanted to get a shot that was creative, and would show them together at the “sweetheart table”. I had my assistant stand camera left with the LED light, and I got this capture. I was careful to frame the shot in a way that would showcase the whole room! When clients spend so much money for a wedding venue, they want to SEE the wedding venue in shots. This is a really good example of that. The blue up lighting was all provide by the DJ, and it really helped (made) the room what it was. A little "wonderland" of magic. 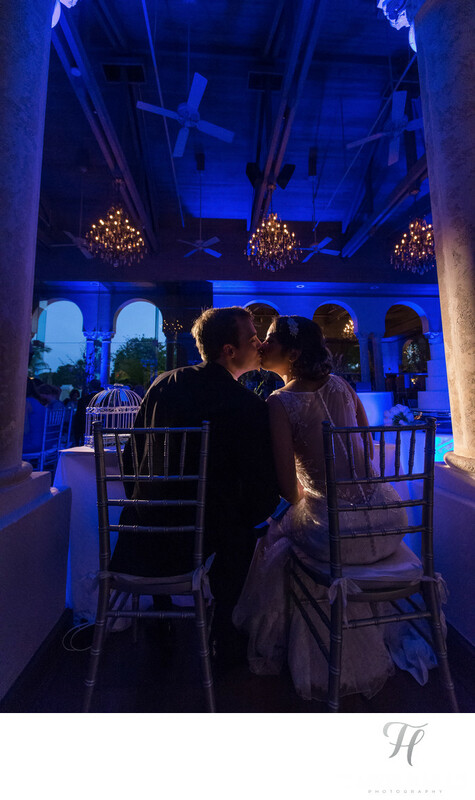 The Coral Gables Country Club is a very interesting place for weddings, because there are several little places to sneak off and take some pretty cool photos! Here is another example of a shot that I did there, and was not something that I have ever seen taken there at all. If you are thinking about this place for your wedding, I don't think you would be disappointed. Location: 997 N Greenway Dr, Miami, FL 33134.